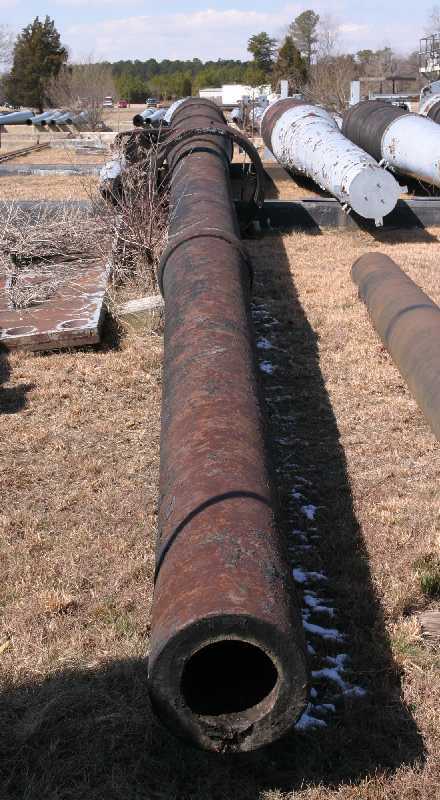 9"/98 (22.9 cm) Mark 1 as it appeared in March 2005 at the Naval Surface Warfare Center in Dahlgren, Virginia. Note that this gun was never rifled. Photograph copyrighted by NavWeaps.com. Presumably inspired by the German "Paris Gun" of World War I, this experimental weapon was converted from a 14"/50 (35.6 cm) gun by lengthening it with a hoop of alloy steel to 900 inches (22.860 m) and installing a heavy alloy-steel liner. The chamber volume was equivalent to that used for the 14" (35.6 cm) guns and the rifling was to be increasing RH from 1 in 48 to 1 in 45. Weight with breech block was 209,429 lbs. (94,996 kg). This weapon was designed to fire a 275 lbs. (125 kg) projectile at a muzzle velocity of 5,000 fps (1,524 mps). The gun was almost completely finished except for the rifling when the project was cancelled about 1919. A reduced-scale version of this weapon was the 3"/105 (7.62 cm) Mark 16. The extra-long length of the 9"/98 (22.9 cm) Mark 1 gun is amply illustrated in this March 2005 picture. The short, rusty gun to the right of the 9"/98 may be a 6"/47 (15.2 cm) Mark 17 prototype. The shorter gray gun to the right of the 9"/98 with the muzzle cover is 13"/35 (33.3 cm) Mark 2 Serial Number 33 which was converted to 14" (35.6 cm) for use at Plate Battery prior to 1923. On the outside, it looks exactly like a 13" Mark 2 with the exception of the bore being one inch (2.54 cm) larger. The next gun over to the right is 14"/45 (35.6 cm) Mark 12 Serial Number 22 which is now on display at the Pennsylvania Military Museum. In the background are two 16"/50 (40.6 cm) guns. The closer one is a Mark 2 and the further one is a Mark 7. Special help from Leo Fischer and James P.